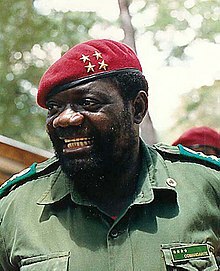 Jonas Malheiro Savimbi was an Angolan political and military leader. He founded and led the National Union for the Total Independence of Angola (UNITA). In 2002 UNITA lost the Angolan Civil War to the People's Movement for the Liberation of Angola (MPLA). ↑ Brittain, Victoria (2002-02-25). "Obituary: Jonas Savimbi". The Guardian. Retrieved 2016-09-12.